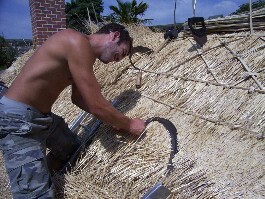 Hand-forged Thatching tools made to order.Thatching is one of the oldest methods of roofing that is still in use today. The Thatchers trade continues to be one of the specialist crafts that is still very much in demand. 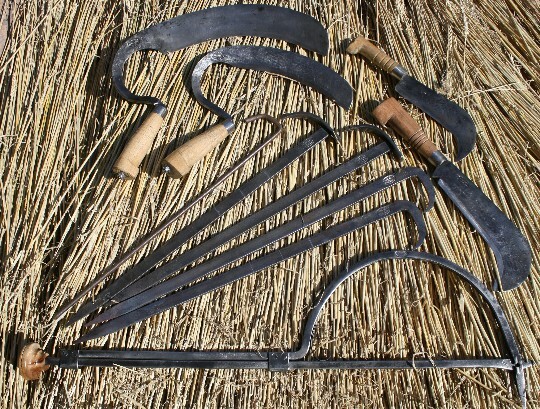 Unfortunately, the skill and training needed by modern day Blacksmiths to be able to produce the tooling required by the Thatcher is disappearing at an alarming rate. We have worked for many years with craftsmen Thatchers to re-produce tooling such as shear hooks, sparhooks, billhooks and leggate pads that are fit for purpose and that will last for several generations. Our shearhook design is tried and tested, with many satisfied customers, we can also produce tooling to your own preferred pattern if required. 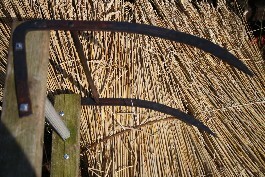 We make the range of edge tools shown. 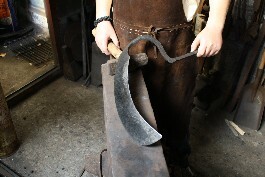 All are hand forged from a medium carbon tool steel and hardened and tempered in the forge in the time honoured way. 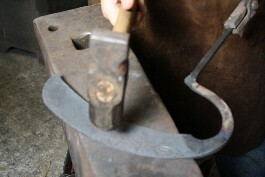 The only modern addition is to thread the end of the tang and secure the handle with a nyloc nut to enable the handle to be changed or taken off for repair. Handles are usually hand made from Elm or a locally available hardwood. Our sparhooks and billhooks are made to a traditional Dorset pattern or we will manufacture to any pattern that you wish to supply. Pins can be made from round or flat material and are supplied any length to a maximum of 24"